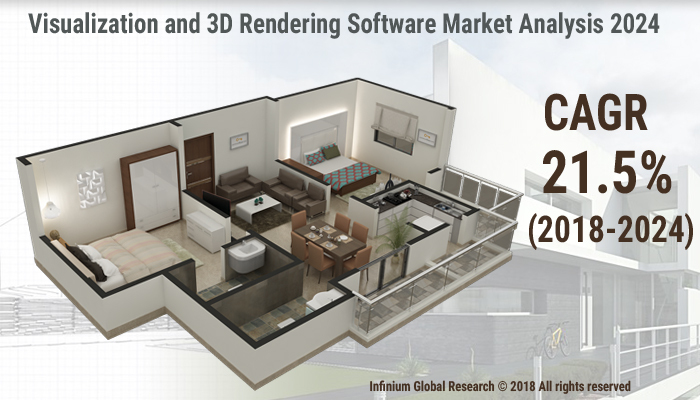 A recent report published by Infinium Global Research on visualization and 3D rendering software market provides an in-depth analysis of segments and sub-segments in the global as well as regional visualization and 3D rendering software market. The study also highlights the impact of drivers, restraints, and macro indicators on the global and regional visualization and 3D rendering software market over the short term as well as long term. The report is a comprehensive presentation of trends, forecast and dollar values of global visualization and 3D rendering software market. According to the report, the global visualization and 3D rendering software market is projected to grow at a CAGR of 21.5% over the forecast period of 2018-2024. 3D rendering software is the process of generating an image from a model by means of computer software. Rendering is used in architecture, simulators, video games, movies and television visual effects and design visualization. Some of the renowned software tools such as Sketchup, Blender, Auto-Cad, and Rhino aids the designers to provide their innovative designs to various sectors such as industrial, real estate sectors, media, and entertainment industries among others. 3D rendering software offers a huge benefit for graphics engineers to design photorealistic models and provide blueprints to the clients to influence the skill capabilities for designing environmental and product designs. The software is used for various applications such as product design & modeling, animation, and visualization & simulation. These solutions help in real-time marketing, product designing, and training among several other applications. Growing prominence on cost and time management and the mounting need for realistic media are the major factors driving the growth of the visualization and 3D rendering software market. Increasing demand from real estate construction sector to frame unique architectural design of the buildings and also the emergence of building smart cities in emerging economies are anticipated to strengthen the market growth. Moreover, enhancement in technology has boosted the gaming industry. Therefore, there is an increase in the number of people playing games on laptops, computer systems, and mobile gadgets. This, in turn, has rushed the demand for the high-level graphical imaging in video games, cinematography, and gaming industry. However, the dearth of infrastructure is one of the limiting factors that may hamper business critical functions in visualization and 3D rendering. Furthermore, the growth of high definition 3D viewing experience is anticipated to create several growth opportunities for the key players in the global visualization and 3D rendering software market over the years to come. In addition, the use of visualization and 3D rendering software in reducing the time for finalizing product images and thus creating marketing material faster. These factors in industries such as entertainment, automotive, architecture, advertising, and web design are expected to increasingly employ visualization and 3D rendering tools to create natural scenes for use in media or client engagement purposes. Among the regions, North America dominated the global visualization and 3D rendering software. The growth in the North American region is due to the domicile of a large number of prominent players such as Autodesk, Inc.; Adobe Systems Incorporated; and Dassault Systems. Moreover, the Presence of robust wireless connectivity in regions such as North America has facilitated widespread adoption of visualization & 3D rendering software. Asia Pacific region is predictable to have noteworthy growth over the forecast period. Real estate sector is supposed to be the fastest growing segment due to surging projects of smart cities in countries such as India and China. Furthermore, the large investment of companies in research and development for better and accurate precision of the visualization of the images is expected to have a significant growth rate in the Middle East and Africa. The report on global visualization and 3D rendering software market covers segments such as deployment type, application, and end user. On the basis of deployment type, the sub-markets include on-premises and cloud. On the basis of application, the sub-markets include architectural and product visualization, high-end video games, training simulation, and marketing and advertisement. On the basis of an end user, the sub-markets include architecture, engineering, and construction, healthcare and life sciences, manufacturing and automotive, gaming, media and entertainment, and academia. The report provides profiles of the companies in the market such as Siemens AG, Autodesk, Inc., Adobe Systems Incorporated, Nvidia Corporation, Next Limit Technologies, SAP SE, The Foundry Visionmongers Ltd., Render Legion S.R.O., Luxion, Inc., and Corel Corporation. The report provides deep insights into the demand forecasts, market trends, and micro and macro indicators. In addition, this report provides insights into the factors that are driving and restraining the growth in this market. Moreover, The IGR-Growth Matrix analysis given in the report brings an insight into the investment areas that existing or new market players can consider. The report provides insights into the market using analytical tools such as Porter's five forces analysis and DRO analysis of visualization and 3D rendering software market. Moreover, the study highlights current market trends and provides forecast from 2018-2024. We also have highlighted future trends in the market that will affect the demand during the forecast period. Moreover, the competitive analysis given in each regional market brings an insight into the market share of the leading players.